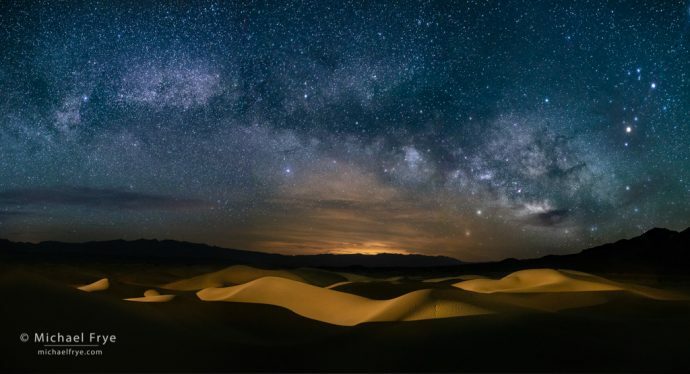 Milky Way over the Mesquite Flat Dunes, Death Valley. We set up continuous, low-level lighting on the dunes, using two LED light panels, so that we’d have consistent lighting for each frame while capturing multiple-image panoramas. I gave everyone a homework assignment before the workshop to practice capturing panoramas, as you don’t want to try that for the first time in the dark in the sand dunes! Everyone did really well and managed to capture a panorama that stitched together properly. I used Lightroom’s Panorama Merge to blend three images together for this final photograph. The exposures for each frame were 20 seconds at f/2.8, ISO 3200. 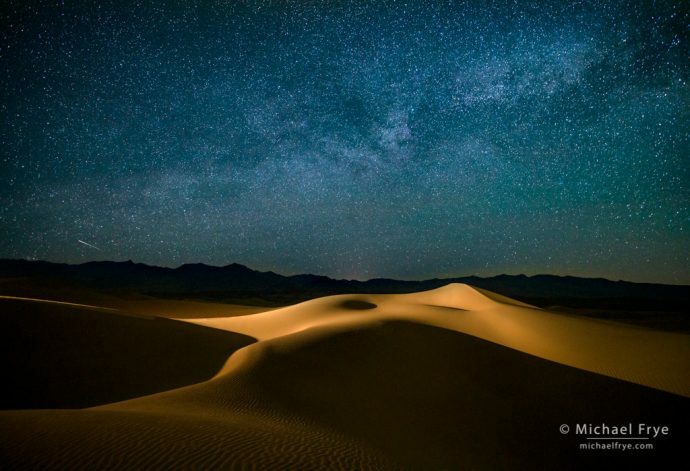 As I mentioned in my previous post, we had two beautiful nights in the dunes during our recent Death Valley workshop. Photographically, the dunes work really well both day and night, as the sculptural quality of the sand that works so well with low-angle sunlight also lends itself to light painting. One night we stayed out in the dunes through the wee hours of the morning, photographing star trails, then the Milky Way, followed by the moonrise and moonlight on the dunes. And when the sky started to lighten we decided we may as well wait around for sunrise. As I thought about locations to photograph last Wednesday’s lunar eclipse, I kept coming back to the idea of putting sand dunes in the foreground. Dunes seemed appropriately lunar. 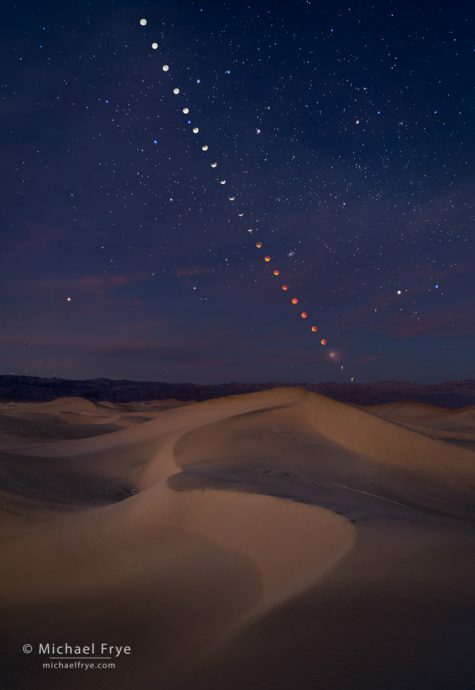 I initially planned to go to the Mesquite Flat Dunes in Death Valley, but as the eclipse approached the forecast called for high clouds moving through much of the western U.S., so I kept a close eye on the forecasts. Two days before the eclipse it looked like the further south we went, the fewer clouds there would be, so Claudia and I headed for the Kelso Dunes in Mojave National Preserve. In case you haven’t heard, there’s a total lunar eclipse coming up on January 31st. 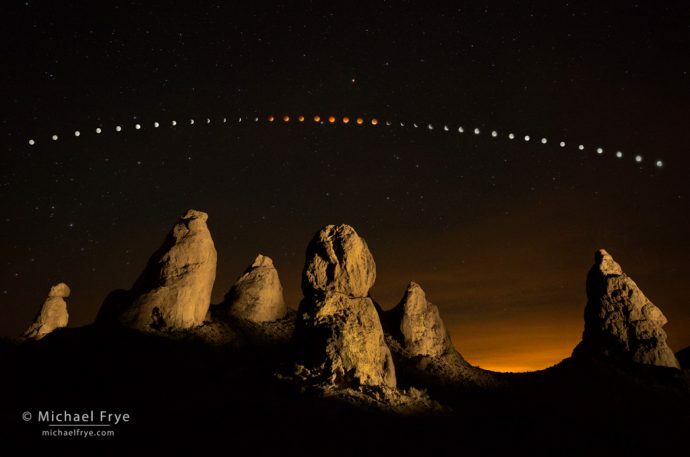 The total eclipse will be visible in central and western North America, Australia, and much of Asia. It will also be a “blue moon,” (the second full moon of the month), and a “supermoon,” (with the moon closer to the earth than normal, so it will look slightly larger). This page shows where the eclipse will be visible, as well as the timing of the event. In North America the eclipse will occur as the moon is setting in the west just before sunrise. The further west you go, the higher the moon will be during totality, and the longer the eclipse sequence you can see. People in the mountain states should be able to see the entire one hour and sixteen minutes of totality, while those of you in the northwest could see (with clear skies) all of totality plus all of the partial eclipse phase afterwards. Unfortunately, the total eclipse will not be visible on the east coast of the U.S. and Canada. 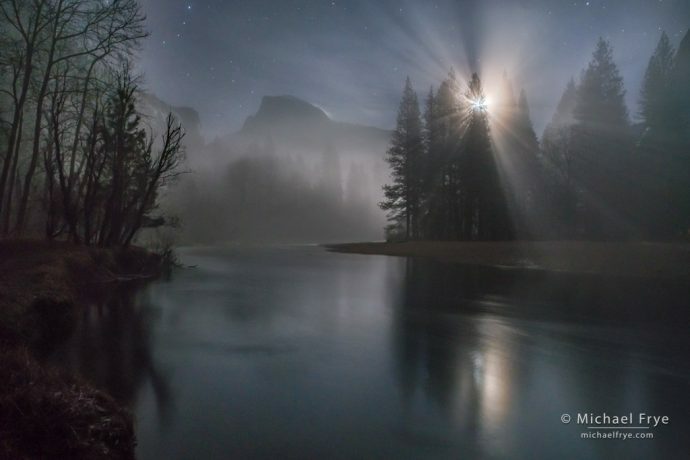 Misty moonrise, Half Dome and the Merced River, Yosemite. 15 seconds at f/4, ISO 1600. On the few occasions when we’ve had precipitation this winter, I always seemed to have some commitment that prevented me from getting out to photograph. But this time I didn’t have any pressing deadlines, so I kept a close eye on the weather, hoping to get up to the valley to photograph the storm clearing. 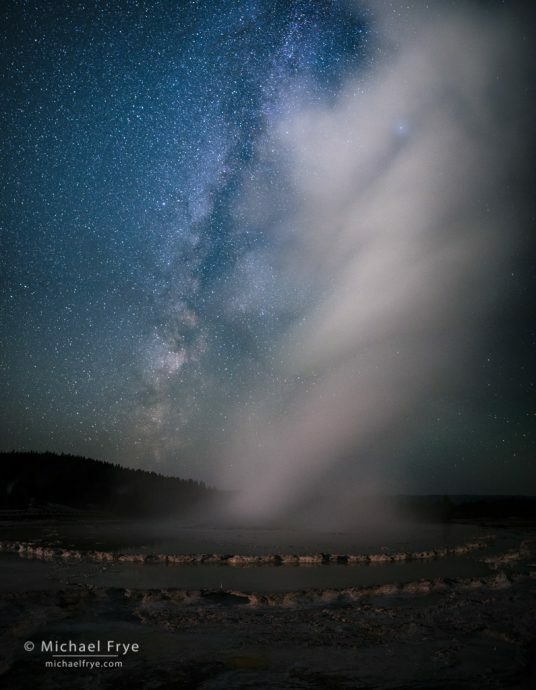 Great Fountain Geyser and the Milky Way, Yellowstone NP, WY, USA. I photographed this geyser two nights in a row. On the first night I joined another photographer from Florida, but on the second night I miraculously had it to myself. This is the one image in this post where I used my own lighting, using two LED panels to add subtle illumination to the geyser and its beautiful terraced pools. 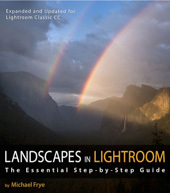 This photograph is a stitched three-frame vertical panorama, captured with my 20mm Rokinon lens. Each exposure was 20 seconds at f/2.5, ISO 6400. Next to Yosemite, Yellowstone might be my favorite national park. 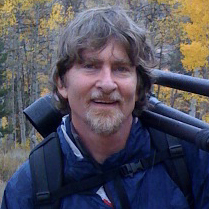 But I hadn’t been to Yellowstone since 2003 – way too long! So after watching and photographing the eclipse in Idaho, Claudia and I decided to head to Yellowstone. We started in the remote, quiet, beautiful, southwest corner of the park, near Cave Falls, an area we’d never been to before. Then we moved into the Madison campground, where, miraculously, we had been able to secure a last-minute reservation.